While most people think of a garnet as red, it occurs in almost every color. The rarest is blue. Garnets are can be found throughout the world. The United States, Brazil, Canada, Germany, Russia, Madagascar, Tanzania, Kenya and India have produced abundant amounts. The word garnet derives from the Latin "granatum" which means "seed-like" especially like the seeds in a pomegranate. Garnets have been widely known for thousands of years and are found in jewelry from ancient Egyptian, Greek and Roman eras. The Greeks called garnets "nuktalopos" meaning "lamp stone". They believed that wearing a garnet around the neck gave one the ability to see in the dark. Noah, it is reported in one biblical legend, used a lantern made from garnets in order to safely steer his Ark through the darkness of the night. Cabochon cut garnets have been very important in Christianity, often used to represent Christ's passion and martyrdom. During the Middle ages, garnets were used to protect against the plague, eliminate sadness and prevent evil thoughts. 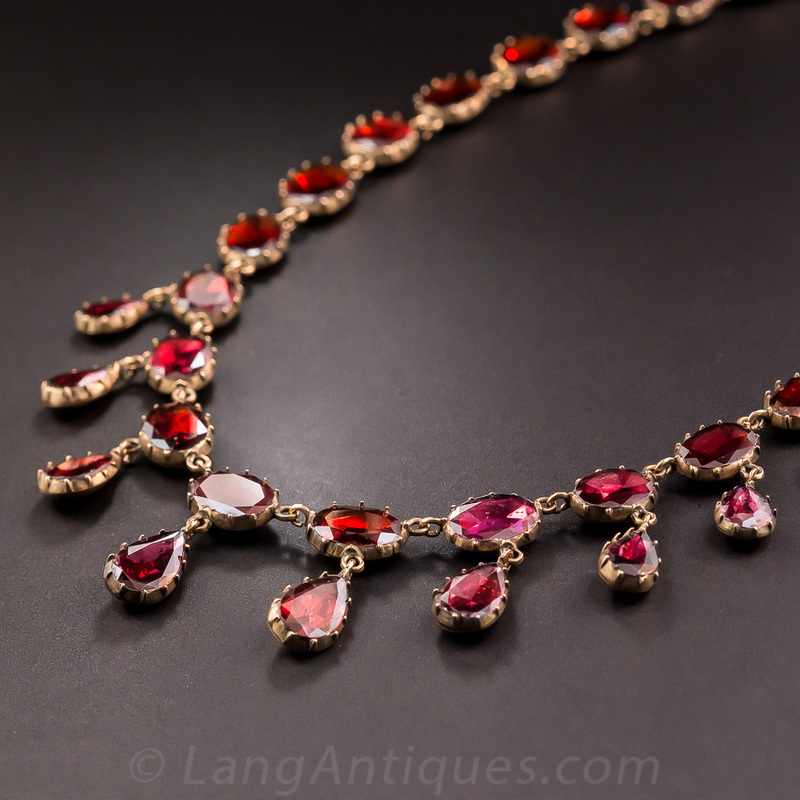 And when hung around the neck, garnets were a sure cure for indigestion and sore throats. Garnet is the birthstone for January and the gem to commemorate the 2nd Anniversary. Garnet helps in motivation and is known as the stone for a successful business. It makes a wonderful executive gem, particularly for women. In addition, garnets foster passion and courage. They help stimulate devotion to your family and friends, while also helping to focus on goals. Garnet can stimulate the senses, and increase your stamina and vitality. It is a gem of the base chakra and awakens the Kundalini.